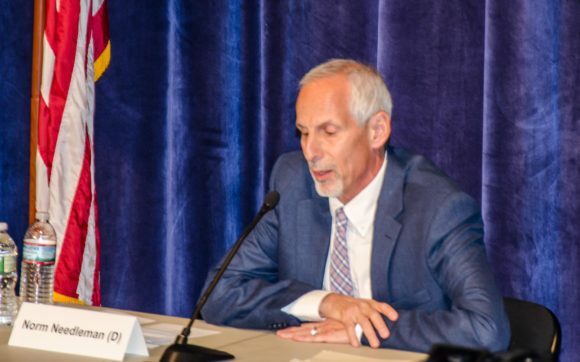 ESSEX — Earlier this week, State Senate candidate and local businessman Norm Needleman spoke out against the yet-to-be-announced state takeover of local health departments. 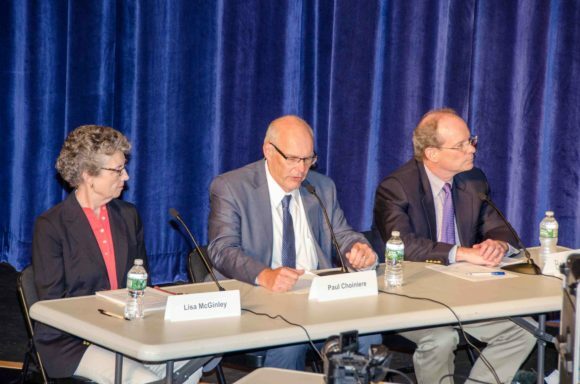 Needleman opposes the top-down, behind-the-scenes process which includes the elimination of local health departments, the loss of local control, and increased cost to towns in what amounts to a regional property tax. The draft changes in Connecticut state statutes were distributed to town Health Directors as “draft Local Health Consolidation Statutes” by the Commissioner of Connecticut Department of Public Health Raul Pino. Lyme Republican First Selectman Ralph Eno agreed with Needleman. The changes propose eliminating local health departments and consolidating them under one board and director for each county. 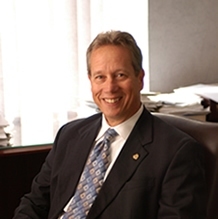 Norm Needleman is the founder and CEO of Tower Laboratories, a manufacturing business. As CEO, he has built the business over the past 37 years to become a leader in its segment, employing over 225 people. Needleman is in his 3rd term as First Selectman of Essex and was first elected as a Selectman in 2003. 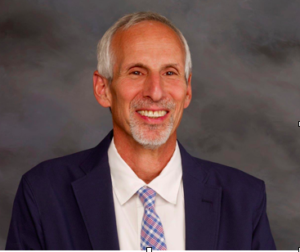 Needleman is the Democratic candidate for the 33rd State Senate District which consists of the towns of Chester, Clinton, Colchester, Deep River, East Haddam, East Hampton, Essex, Haddam, Lyme, Portland, Westbrook, and part of Old Saybrook. 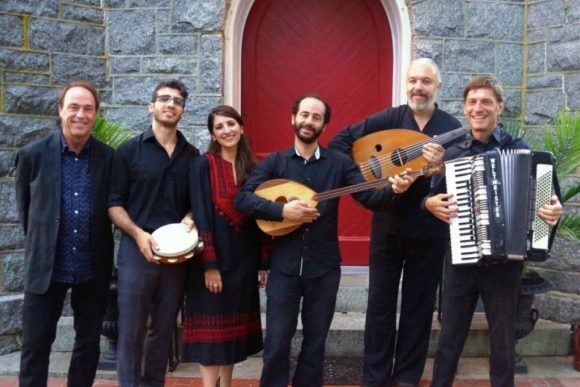 Ramzi Aburedwan (third from right) stands with the other members of the Dal’Ouna Ensemble that will be performing in Old Lyme on Sept. 30. OLD LYME — The Tree of Life Educational Fund presents a performance by Ranzi Aburedwan and his Arabic-French Dal’Ouna Ensemble in a program of music and book-readings on Friday, Sept. 30, at 7 p.m. at the First Congregational Church of Old Lyme. This event is part of the national concert and book tour of Children of the Stone/Dal ‘Ouna, which celebrates Palestinian musician and educator Ramzi Aburedwan and his belief in the power of music and culture to transform lives and resist oppression. The tour corresponds with the paperback release of Children of the Stone: The Power of Music in a Hard Land (Bloomsbury, April 2015/paperback March 2016) by Sandy Tolan, author of the international bestseller, The Lemon Tree. Featured in concert will be the powerful music of Ramzi Aburedwan and his Arabic-French Dal’Ouna Ensemble and the Lebanese singer, Abeer Nehme : a dynamic fusion of Palestinian Arab folk, classical, jazz and world music. Ensemble members include renowned composer, violist and buzouk player Ramzi Aburedwan and percussionist Tareq Rantisi from Palestine, oud player Ziad Ben Youssef from Tunisia, Edwin Buger from Yugoslavia on accordion. Michael Dabroski will join the group with his Palestinian violin, and there will be readings from Sandy Tolan’s book, Children of the Stone: The Power of Music in a Hard Land. Children of the Stone tells the dramatic story of Ramzi Aburedwan’s life growing up in an occupied Palestinian refugee camp and his transformation from a stone throwing youth of the first intifada, to a talented musician studying at the Edward Said Palestine National Academy of Music and a French Conservatory and his final return to Palestine to realize his life’s dream of founding a music school, Al-Kamandjati that has centers in Gaza, the West Bank and Lebanon. He views Al-Kamandjati and related projects with international musicians as a combination of safe haven, creative resistance, and trauma therapy for the least fortunate Palestinian children, many living in refugee camps. World-famous cellist Yo-Yo Ma said this about Sandy Tolan’s book:“In a world where so much popular fiction depicts life in a dystopian world, it is refreshing to have this non-fiction account that reflects one individual’s belief in the power of music and culture to transform lives. Congratulations to Sandy Tolan for bringing us the story of Ramzi Hussein Aburedwan, his philosophy and his personal mission to make a difference. His story is proof of the famous words of Margaret Mead –‘Never doubt that a small group of thoughtful, committed citizens can change the world indeed, it’s the only thing that ever has’”. All are welcome to attend this concert and book-reading. General admission is $10 at the door. Admission is free to students and those aged under 21. The Tree of Life Educational Fund (TOL) a 501(c)(3) non-profit corporation was established by The First Congregational Church of Old Lyme to provide cross-cultural and transnational travel experiences, interfaith conferences and educational opportunities to help participants to become more enlightened and more engaged in making this a more just and peaceful world in which to live. Detail from a featured work, ‘Untitled,’ by David Rau in the ART-ISTRY exhibition opening Oct. 1 at the Lori Warner Gallery. CHESTER — ART-ISTRY, featuring new work by David D. J. Rau and Christopher B. Steiner, opens Saturday, Oct. 1, at the Lori Warner Gallery in Chester with a reception from 5 to 8 p.m. to which all are welcome. On view will be three-dimensional assemblage pieces by Rau, and limited edition prints and original photomontage works by Steiner. This exhibition will be a very special one since the Lori Warner Gallery invites artists to exhibit their work once per year and the selection process is highly competitive. David D.J. Rau’s Vintage Hardware Drawer series, was inspired by 14 antique drawers that originally held screws, bolts, and plugs (according to the various labels). Rau transforms them into miniature surreal stage sets using vintage and antique pieces collected over the years. Inspired by the past, his aesthetic combines vintage photography, tattered paper, intriguing ephemera, and antiques into humorous, ironic, and most importantly, beautiful scenes. Rau is the Director of Education & Outreach at the Florence Griswold Museum in Old Lyme, Conn. Responsible for the public programs and making connections between the art and history and the Museum’s visitors. Rau holds a masters degree in Art History and a certificate of Museum Studies from the University of Michigan. Rau has worked at Cranbrook Art Museum; the Henry Ford Museum and The Currier Gallery of Art. Rau also teaches Museum Studies at Connecticut College. Detail from “The Fall of Suburban Man” (2016) by Christopher Steiner. 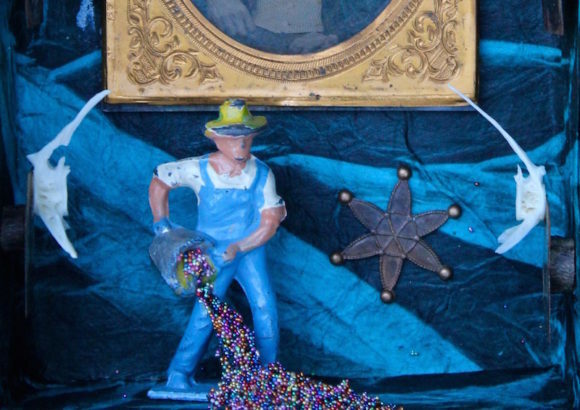 Christopher B. Steiner has always been partial to artists with “a deep sense of wit and (twisted) humor.” His work has been described as “irreverent parody with a twist of dark absurdity.” Steiner deconstructs iconic or cliché images and well-rehearsed art-historical traditions in order to invite alternative readings. These interventions are meant to surprise, delight, destabilize, and sometimes even shock. His intent is to “reinvigorate familiar images by bringing to them new perspectives and insights through unexpected juxtapositions and non sequitur visual tropes”. Steiner holds an undergraduate degree from the Johns Hopkins University, and a Ph.D. in anthropology from Harvard University. He is the Lucy C. McDannel ’22 Professor of Art History and Anthropology at Connecticut College, where he also serves as Founding Director of the Museum Studies Program. Steiner is also a member of the board of trustees of the Lyman Allyn Art Museum, where he was also Interim Director in 2003-04. 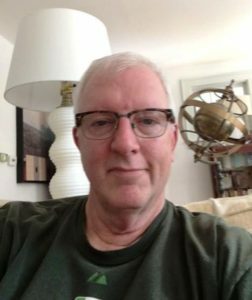 In addition, he serves on the Advisory Boards of both the Florence Griswold Museum and the Bellarmine Museum at Fairfield University. The exhibition will be on view through Dec. 1, and is free and open to the public. The Lori Warner Gallery is located at 21 Main St. in Chester, Conn.
IVORYTON — On Sunday, Oct. 2, the 10 a.m. worship service will be a celebration of the life, wisdom, and spirituality of St. Francis of Assisi. The hymn “All Creatures of Our God and King”, based on his writings, will be sung. The meditation will reflect on his life, his teachings, and his impact. The service will include the Sacrament of Communion on this World Communion Sunday. The Ivoryton Congregational Church is at 57 Main St. in Ivoryton and the pastor is the Rev. John Van Epps. AREAWIDE — To help offset a cut in state transit funding, the Estuary Transit District is considering an increase to fare on all 9 Town Transits services. The proposal would see the cash fare on all routes increase from $1.50 to $1.75. Trips on Dial-A-Ride and off-route would increase from $3 to $3.50. Multi-ride tickets and monthly passes will increase to $15.75 and $57, respectively. The fare proposal also includes the agency’s first disabled fare. It would provide a discounted rate of $0.85 to persons with disabilities. ETD says this would provide relief to many in the disabled community that heavily rely on public transit. ETD officials say the increase is necessary due to a prevent service reduction following a statewide cut by the state to transit budgets. A public hearing on the proposal will be held on Thursday, Sept. 29, from 4 until 6 p.m. at Old Saybrook Town Hall first floor conference room, 302 Main St, Old Saybrook, CT. Written comments may be submitted until Oct. 14, to Estuary Transit District, 17 Industrial Park Rd, Suite 6, Centerbrook, CT 06409. For a full listing of the new fare schedule, visit www.9towntransit.com/fares or call 9 Town Transit at 860-510-0429. ESSEX — Officers for the Essex Garden Club for 2016-2017 are Barbara Burgess, President, Augie Pampel, 1st Vice President, Barbara Muhlfelder, 2nd Vice President and Assistant Treasurer, Betsy Godsman, Recording Secretary, Judy Greene, Corresponding Secretary, and Patricia Mather, Treasurer. In Barbara Burgess’s opening remarks, at the September meeting, she described the club’s agenda and activities for the upcoming year ahead and introduced the theme for the year “ Partnering for Success” She shared how The Essex Garden Club has partnered with the Land Trust in sponsoring a conservation program, this year on the topic of Native Pollinators. In addition the Essex Garden club provides resources to the libraries and schools to partner in educating both adults and children in our community. For many years the Club has partnered with the Town of Essex to keep our parks and community looking beautiful. These strong partnerships continue to result in both benefiting our organizations and the community. Tri-Town Youth Services would like to thank the tri-town community for supporting our signature fundraiser, Taste of the Valley, which was held at the Deep River Historical Society on the evening of September 23. Our thanks to the restaurants who were present and shared tempting appetizers and desserts: LaVita Gustosa, Dough on Main, Rustica, and Riverside Thai, as well as to many others who sent delicious platters. We wish to thank the Essex Lions for providing tables and chairs. Special thanks to sponsors, including Whelen Engineering, Tom Alexa, Coburn Financial Group, Middlesex Hospital, Tower Labs, and many others. Our silent auction had many creative offerings, thanks to many individuals and local businesses. Blues on the Rocks provided tasteful music for listening and dancing. Thanks to everyone who made it an evening to remember as well as a meaningful contribution to Tri-Town Youth Services. Tri-Town Youth services supports and advances the families, youth, and communities of Chester, Deep River, and Essex. They coordinate and provide resources needed to make positive choices, reduce substance abuse, and strengthen the relationships that matter most. 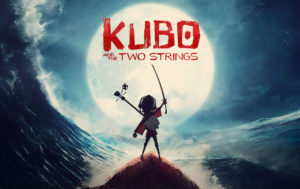 Truly, if you enjoy learning about ancient mythology, you will enjoy watching Kubo and the Two Strings, brought to you by Laika, the filmmakers behind Coraline and The Boxtrolls. With an all-star-studded cast that includes Charlize Theron, Matthew McConaughey, Ralph Fiennes, Rooney Mara, and Star Trek actor/turned social media personality George Takei, this stop-motion animation film does not disappoint. We are told the story of Kubo, a young one-eyed boy, who cares for his ill mother by transforming paper into origami masterpieces through his shamisen (a string instrument indigenous to Japan). After staying out past dark (as he was warned against many times), his mother’s sisters destroy his village and attempt to take his remaining eye. Upon escaping the terror of his aunts, Kubo comes across the incarnate version of his wooden monkey (voiced by Ms. Theron) brought to life by his own mother’s magic, and eventually Beetle (Mr. McConaughey), who join him on a quest to retrieve the armor worn by his father, a Samurai warrior. Perhaps what is most rivaled by its story and performances is its original score, which I have no doubt will at least be nominated by many award shows this upcoming season. It was released in 3D, a trend in movies that I do not understand. Despite being a family-friendly film, I would caution those who have very young children from seeing this. One of the main themes revolves around the title character missing an eye and his grandfather and aunts seeking retribution on his life or his remaining eye, as well as there being some frightening images and scary scenes. But anybody above the PG-warned audience will find this movie to be an ultimate delight. Supercool will play at the Concert in the Garden on Nov. 26. CHESTER — Leif Nilsson presents a special Concert in the Garden at the Leif Nilsson Spring Street Studio located at 1 Spring Street in Chester Center on Saturday, Nov. 26 from 7-9pm for featuring Supercool. BYOB, $20 donation, Inside the Gallery if inclement weather. SuperCool is a band with an interesting story, and the musical goods to back it up. Jeffrey Marshall (bass and vocals) has a self-taught bass technique. He is a soulful player, delivering dynamic and passionate bass lines, while playing harmonica and singing lead as well. Daniel Levanti (guitar and vocals) honed his guitar skills at Berklee College of Music, and through touring during his years in Europe. Together they share a special friendship and creative bond. Part of their intriguing story is that these Americans met randomly in Prague, Czech Republic. Despite the apparent randomness of their hooking up, they have formed a solid musical partnership. They have been able to unite emotions and experiences and turn them into songs. These songs can be heard on their debut album, Greatest Hits Vol. I., available on Earwave Records, and Greatest Hits V.II, available on Championship Music. All songs are written by Daniel Levanti and Jeffrey Marshall. Supercool will be joined by drummer Ian Kelly. 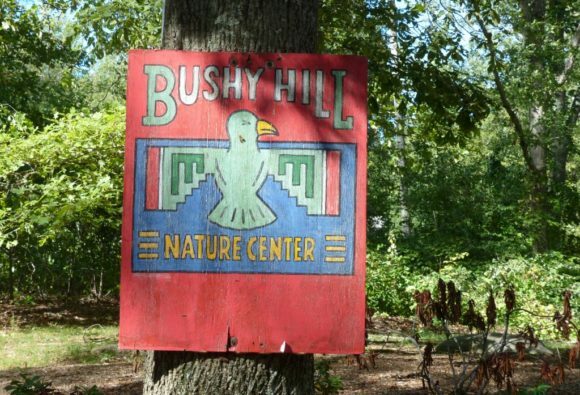 ESSEX — Become acquainted with the 700-acre Incarnation Camp and Bushy Hill Nature Center, Essex’s largest privately owned property on Saturday, Sept.24, 9 a.m. at Bushy Hill Nature Center, 253 Bushy Hill Rd., Ivoryton. Phil Miller, Bushy Hill Nature Center’s Director, will guide visitors through this remarkable assemblage of woods, fields, lakes, and wetlands, seeking out the rich range of plants and animals that call it home. This walk is suitable for all ages and involves moderate walking of up to one and a half hours. Rain/thunderstorms cancel. Alternate rain date: Saturday, Oct. 1. AREAWIDE — The Estuary Council of Seniors in Old Saybrook will sponsor a major fundraiser Shoreline Chefs, a delicious way to support Meals on Wheels, on Sunday, Sept. 25, at Water’s Edge Resort & Spa, 1525 Boston Post Road, Westbrook, from 3 to 6 p.m. This savory event features local professional and notable locals cooking up a storm in small plate tastings. Twenty chefs are expected to participate. A Beer Tasting by 30 Mile Brewery is included as well as wine from The Wine Cask. Entertainment will be by the Von Zells. The special guest is author, creator, and Executive Producer of “Let’s Get Cooking with La Befana and Friends,” Kate West. Tickets are $40 ($45 at the door) and may be purchased in Old Saybrook at the Estuary Council of Seniors, Harbor Light Realty, Harris Outdoors, Pak-it Of Southeastern CT, and Edd’s Place in Westbrook. 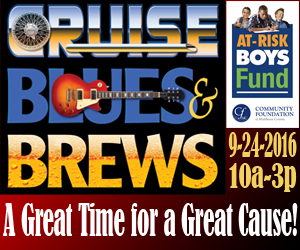 CHESTER — The Second Annual Cruise Blues & Brews will be held Saturday Sept. 24, at the Chester Fair Grounds from 10 a.m. to 3 p.m. (rain or shine). This is a fun-filled family event featuring antique and unique cars, the area’s top blues bands, craft beer, up-scale food trucks, marketplace of vendors, kids play area, games, prizes and surprises. For additional information and to purchase tickets at $15 (kids under 12 free) visit www.atriskboysfund.org. All proceeds benefit the At-Risk Boys Fund at the Community Foundation of Middlesex County. CHESTER — The Verona Quartet will perform works by Mendelssohn, Beethoven and Webern on Sunday, Sept. 25 at 5 p.m. in the first concert of the 43rd season of the Collomore Concert Series at the historic Chester Meeting House at 4 Liberty Street, Chester. 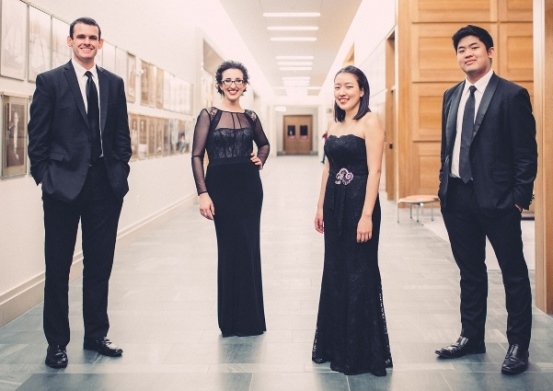 Praised by “Classical Voice America” for their “sensational, powerhouse performance,” the Verona Quartet has set themselves apart as one of the most compelling young quartets in chamber music. They have played at Lincoln Center Alice Tully Recital Hall, London’s Wigmore Hall, the John F. Kennedy Center for the Performing Arts in Washington and the Melbourne Recital Hall in Australia. 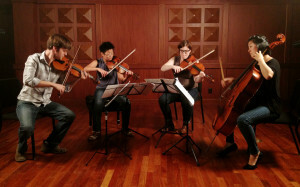 Winner of the prestigious 2015 Concert Artist Guild Competition, they are the Graduate Resident String Quartet at the Juilliard School, where they work closely with members of the Juilliard String Quartet and teach during Juilliard’s academic year. They have also served as visiting artists and teachers at leading international institutions for music education including the Beethoven-Haus (Bonn, Germany), New York University-Abu Dhabi and the Oberlin Conservatory of Music. In less than three years, the Verona Quartet have established themselves as one of the most compelling young quartets in chamber music. Their Chester Meeting House concert on Sept. 25 will be followed by a reception and a chance to meet the artists. Tickets are $25 for adults, $5 for students, or purchase a season subscription now for just $75 for adults, $15 for students. For more information, check the website at collomoreconcerts.org or call 860-526-5162. OLD SAYBROOK — A witty lecture given by internationally acclaimed tenor Brian Cheney and director Josh Shaw entitled “The Abduction from the Seraglio by Mozart … according to Star Trek” is slated for Saturday, Sept. 24, 11 a.m. at the Acton Public Library, 60 Old Boston Post Rd., Old Saybrook. This free lecture is sponsored by The Guild of Salt Marsh Opera in partnership with the Acton Public Library. For more information, call 860-388-2871. September 23, 2016 by Peter Arseneault Sr. Unfortunately some political parties, to boost their standings in the political arena around election time, take to sticking positive labels on themselves and negative labels on their opponents, in hopes of changing people’s minds and winning the election based on untruths and lies. Now while most people hate history, a better understanding of what our future holds for us might be had by looking back at the performance of the current politicians who hold office. For the past 30 years the Democratic Party has held a super majority of votes in the Connecticut Legislature. Simply put what that means is that regardless of what party the Governor was from, the legislature has had the votes necessary to override any vetoes he/she might impose on bills/budgets that the legislature wanted passed. That said, we have a Governor with the lowest approval rating of any Governor in the U.S. and a list of Democratic Legislatures that rubber- stamped anything and everything that he wanted passed. Let us place the blame of a faltering economy, loss of business that moved out of state, loss of jobs, high taxes and lost employment opportunities squarely on the shoulders of those responsible. Let us realize that we don’t have to wait two more years to replace a Governor to effect change in our lives, we have that opportunity this Nov. 8. It’s time to replace the supermajority that represents a party mentality and not the people that voted them into office. Because of the lack of responsible spending/taxation, by our current Democratic Governor/Legislature, our State is on the verge of bankruptcy, our bond rating in the financial market is continually downgraded and the Democratic Party has the audacity to label the Republican Party the party of doom and gloom. They say that the Republicans don’t have any answers to our budgetary problems, yet when it comes time to work on the budget the Democrats lock the Republicans out of the Budget talks. A majority of the people in this state wants our politicians to work together on their behalf but the Democrats won’t allow that to take place. The realistic approach to budgetary problems is to identify, analyze, and find solutions to the problems in a fair, even-handed, professional manner and the only party currently not responsible for this mess is the Republican Party. It’s time to vote out all those Progressive Democrats that are responsible for this financial mess. We just can’t afford them anymore. Please join me, a lifelong Conservative Democrat and now a proud Republican, in voting for the Republican candidates this November. Editor’s Note: The author is a former Democratic Selectman for the Town of Haddam. Photo, courtesy of Chris Morgan, Access Coordinator for the station. 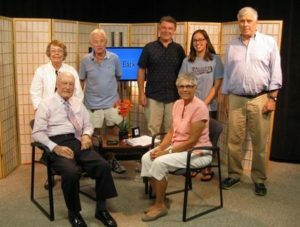 The sixth in a series of programs called Looking Back was recently taped at Valley Shore Community Television. Standing are the technical crew. From left are: Betty Budney, Bill Cook, Al Moncovich, Cori O’connell, and Bill Bevan. Seated are Judge Walter Budney, guest and Mary Ann Pleva, host. The Programs air regularly on Channel 19. Schedules can be found on the Valley Shore Community Television website. 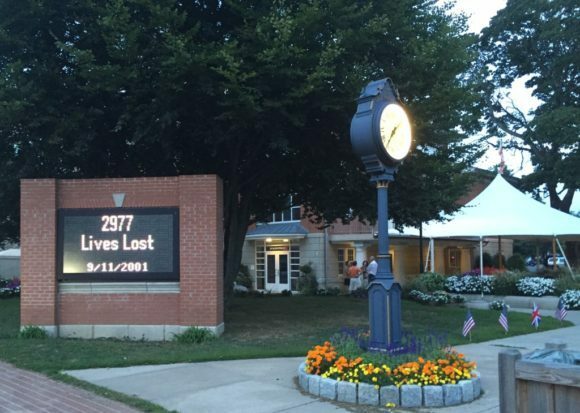 The station is a local non profit organization serving the towns of Durham, Haddam, Killingworth, Chester, Deep River, Essex, Old Saybrook, Clinton, and Westbrook. Production workshops are offered regularly. For more information, call the station at 860-399-1857. An apartment designed by Stephen Wanta. ESSEX — What do a former Vermont residence of a Phish band member, a 96-foot custom motor yacht, a loft inspired by the relationship between Judaic Mysticism and Quantum Mechanics, law offices using strategies similar to those of architect/artist Gordon Matta-Clark (with a bit of the “Terminator” thrown in) and a penthouse combination in “one of the 10 most haunted buildings in New York” have in common? The answer is New York-based architect Stephen Wanta, who will begin the ninth year of the Library’s Architecture Lecture Series on Friday, Sept. 23, at 7 p.m. in The Cube at Centerbrook Architects, 67 Main St. in Centerbrook. Among Wanta’s commercial projects are film and sound production facilities, restaurants, numerous private law offices, and showrooms and trade show exhibition booths for the home furnishings industry. 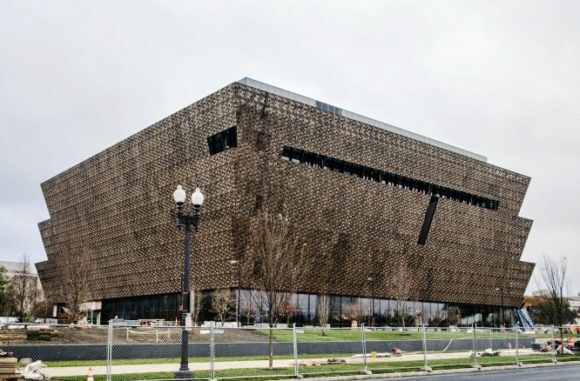 The firm has also designed several museum stores, their pop-up locations and retail outlets. Wanta has designed and executed well over 100 residential projects with budgets from less than $100,000 to over $5 million in New York City, with a number of others across the country and in Europe. The firm is just completing its second long-range motor yacht project; built in Xiamen China and commissioned in Florida. 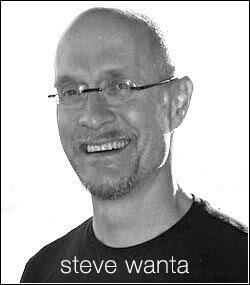 Wanta received his Bachelor of Architecture Degree from the Rhode Island School of Design in 1980 where he received the Reynolds Aluminum School Prize in 1979 and 1980 and The American Institute of Architects Certificate of Merit. He has worked at the offices of Machado & Silvetti, Rafael Vinoly Architects, and at Peter Marino Architect and Associates. Wanta has taught and lectured at a number of schools, including Columbia University, the Rhode Island School of Design, and Rensselaer Polytechnic Institute. My support for Norm Needleman in his candidacy for the 33rd District State Senate seat is not surprising, since I am a member of the Essex Democratic Town Committee. But the reasons for my support go deeper than just party affiliation. 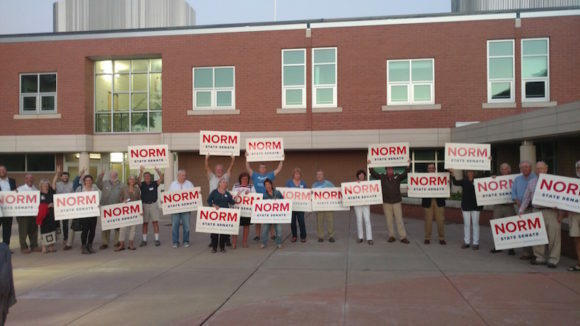 Throughout his decades of involvement in Essex town government, I have seen Norm successfully tackle difficult problems with a unique ability to unite people with differing opinions. I, and virtually everyone I have talked to in state government, believe that Norm’s deep knowledge of small town government and his ability to build consensus will immediately make him a leader in the state senate. That position of leadership will directly benefit our district. So, my support for Norm is not political. Rather, it is a decision to restore influential representation for our district in the state senate. 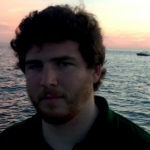 Editor’s Note: The author is a member of Essex Democratic Town Committee. 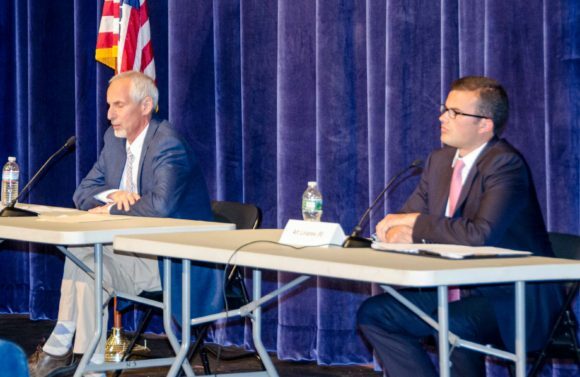 AREAWIDE — The Day and the Chamber of Commerce of Eastern Connecticut are hosting a debate from 7 to 8 p.m. this evening, Thursday, Sept. 22, between the candidates running for the 33rd State Senate District — incumbent Senator Art Linares (R) and Essex First Selectman Norman Needleman (D). Needleman, who is in his third term as first selectman of Essex and was first elected as a Selectman in 2003, is challenging incumbent State Senator Art Linares, who is running for a third term. Linares was first elected in 2012 to the 33rd State Senate District seat, which was held for two decades by the late former State Senator Eileen Daily of Westbrook. He won a second term in 2014, defeating Democrat Emily Bjornberg of Lyme on a 22,762-17,326 vote. The 33rd State Senate District consists of the Town of Lyme along with the Towns of Chester, Clinton, Colchester, Deep River, East Haddam, East Hampton, Essex, Haddam, Portland, Westbrook, and part of Old Saybrook. Questions for the debate may be submitted in advance to p.choiniere@theday.com. To watch the debate, visit www.theday.com. It will be live streamed and available for viewing until the election. Election day is Tuesday, Nov. 8. Tri-Town Youth Services and Face Arts Music in Deep River are teaming up to offer an exciting opportunity for 20 families on Saturday, Sept. 24, from 1 to 3 p.m. at the music school. Join the teachers at Face Arts Music for an introduction to different types of instruments, including piano, guitar and your own voice. Learn to play some chords, get a drum beat going and have fun. The afternoon will finish with a mini-concert. This Family Fun Day is a free event, open to 20 elementary school students and their families. Spaces fill quickly, so contact Tri-Town to reserve your spot. Call 860-526-3600 or register online at tritownys.org. Face Arts Music provides quality music instruction to students, keeping learning educational and fun. Their passionate team of instructors offers drum, guitar, violin and piano lessons for beginner to advanced students, in addition to vocal lessons and specialized private instruction in blues guitar, classical guitar or folk violin lessons. For a complete list of their offerings, visit faceartsmusic.com. 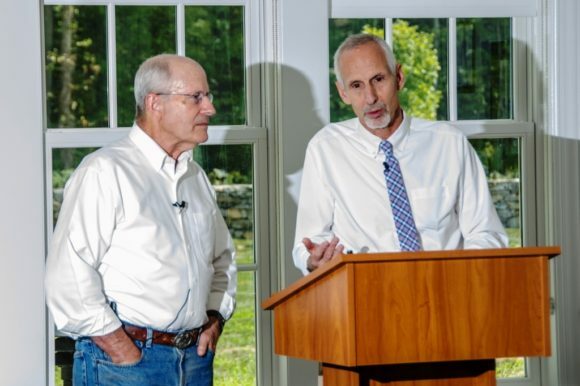 AREAWIDE — The Democratic Town Committees of Lyme, Haddam and East Haddam are jointly sponsoring a “Meet the Candidates” event with Norm Needleman and Joe Courtney at the Gelston House in East Haddam on Monday, Sept. 19, from 6:30 to 8:30 p.m. All are welcome. 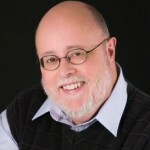 Needleman (D) is challenging two-term incumbent Art Linares (R) for the position of 33rd District State Representative. Courtney is running for another term as US Representative for Connecticut’s Second Congressional District, a position he has held since 2007..
Light refreshments will be served. A cash bar will be available. AREAWIDE — Celebrate the Holiday Season by singing the Christmas Section of Handel’s Messiah, plus Hallelujah and Worthy is the Lamb. Non-auditioned registration-rehearsal, Mon. Sept. 12, and 19, 7 p.m. at John Winthrop Middle School, 1 Winthrop Rd. Deep River, 06417. Use the rear entrance. All singers are welcome to join Cappella Cantorum MasterWorks Chorus directed by Barry Asch. Be part of the opportunity to practice and perform Messiah, one of the best-known and most frequently performed choral works. Rehearsals are Mondays at 7:30 p.m. Registration $40, Messiah Score $9, pay at CappellaCantorum.org or at registration. The concerts will be performed Dec. 3 and 4. Cappella Cantorum will be joined by the choir of the First Congregational Church of Old Lyme, directed by Simon Holt. Call 860-388-2871 for more information. Auditions for Soloists will be held for Cappella Cantorum Members on Sept. 26, sign-up during registration. University of New Haven faculty member Professor Chuck Timlin has brought his excellent teaching skills to the Essex Library community on topics such as Chaucer, Beowulf, Wordsworth & Frost, and the poetry of Walt Whitman and Emily Dickinson. Now, back again by popular demand, he turns his talents to an examination of classic American short stories. 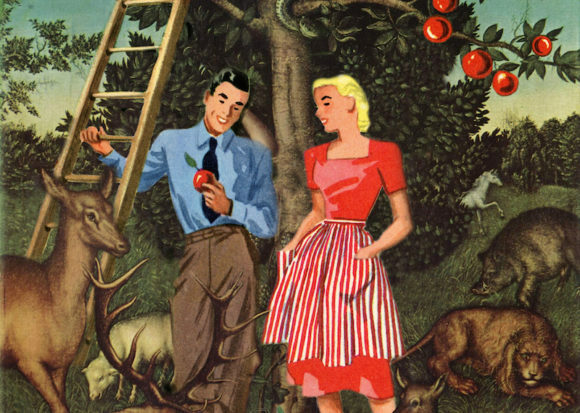 In this series of six seminars, attendees will read and discuss a selection of great American short stories, a literary form that many great writers in America have practiced. In their stories these writers explore the evolution of America and what it means to be American. The group will read stories by Washington Irving, Nathaniel Hawthorne, Ernest Hemingway, Ralph Waldo Ellison, Raymond Carver, and others. All stories can be found online so there is no textbook for this seminar. The series will run at the Essex Library for six Thursdays beginning Oct. 20, from 6:30 to 8 p.m. There will be no meeting on Thanksgiving. This program is free and open to all. For more information or to register, call the Essex Library at (860) 767-1560. 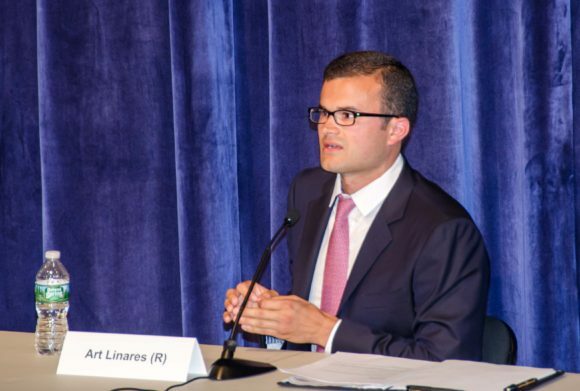 Sen. Art Linares and the Connecticut Senate Republicans on Sep. 15 unveiled their policy agenda “A Confident Future” for the 2017 legislative session. From left to right: Sen. Henri Martin, Sen. Kevin Witkos, Sen. Len Fasano, and Sen. Linares. Details of the plan can be found at www.ctsenaterepublicans.com and www.SenatorLinares.com . AREAWIDE — On Sept. 15, Sen. Art Linares and the Connecticut Senate Republicans unveiled their policy agenda for the 2017 legislative session. The plan “A Confident Future” presents multiple policy proposals aimed at moving Connecticut in a new direction to grow jobs, renew business confidence, build opportunity, and restore people’s trust in government. The plan outlines the Republican priorities the caucus will pursue in the 2017 legislative session which begins in January. 1) Creating Financial Stability and Predictability. A reliable state with business confidence is the best environment to grow jobs. By reforming the state’s spending and borrowing, Republicans plan to improve the state’s financial health to support a more predictable business environment so that job creators don’t have to worry about what new tax proposals could be awaiting them in bad budget years. 2) Supporting Families and Growing Opportunity. Connecticut’s future depends on supporting our families and creating opportunities for all to succeed. The Republican plan includes policy proposals to strengthen Connecticut cities and help improve life for families in urban areas. It also includes reforms for the state’s child welfare agency, proposes restoring education funding that was cut in recent budgets, protects seniors and the developmentally disabled, and offers new ideas to improve health care and insurance quality and accessibility. 3) Restoring Trust in Government. The Republican legislative agenda contains proposals to ensure that government operates efficiently and transparently and uses tax dollars as wisely as possible. Proposals include ideas to reduce DMV wait times, eliminate waste, live within our means, strengthen campaign financing laws, and create a more transparent budget writing process. Sen. Linares represents Chester, Clinton, Colchester, Deep River, East Haddam, East Hampton, Essex, Haddam, Lyme, Old Saybrook, Portland, and Westbrook. He can be reached at 800 842-1421 and Art.Linares@cga.ct.gov . 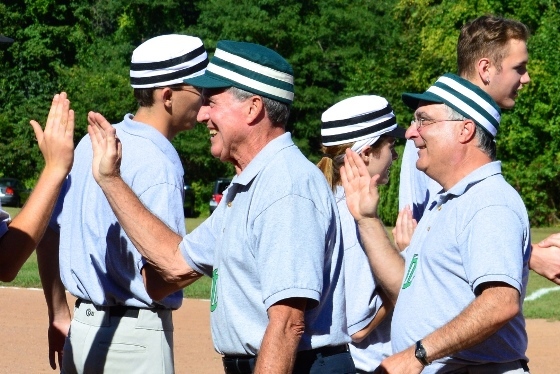 Keith “Double D” Dauer (left) and Manager Tom “Yukon” Miceli are all smiles following in the high-five line following a Chester Squirrels win over the ICE Elelphants in last year’s tri-town round-robin games. On Sunday, Sept. 18 at 2 p.m., teams representing Chester (the “Chester Squirrels”), Deep River (“Deep River Haz Beenz”) and Essex (“ICE – Ivoryton, Centerbrook, Essex – Elephants”) will be meeting in a round-robin format at Devitt Field in Deep River. There is no admission charge for this family event sponsored by the Chester, Deep River and Essex Historical Societies. Once again, players will be wearing period shirts and caps and you can count on spotting a few ‘game day’ mustaches. No gloves are allowed (the ball was somewhat softer then) and a striker (term for ‘batter’) was out if a fielder caught a ball on its first bounce under 1857 rules. Free programs will be provided at the game with team rosters, 1857 rules and terminology. Old-time refreshments will be sold by Chester Rotary. Bring lawn chairs to supplement the limited seating at the field. The rain date will be Sept. 25. So, using more terminology from the past, make a point to be a Crank (fan) at the Match (game) when the Club Nine (team) legs it (runs to a base) hoping to make Aces (runs) before Player Dead (an Out). All in all it makes for a wonderful, educational and entertaining way for all ages to enjoy the great American Game as it was 150 years ago. We think Walt Whitman would agree. Ben Hunter and Joe Seamons will perform at the Connecticut River Museum on Sept. 18. 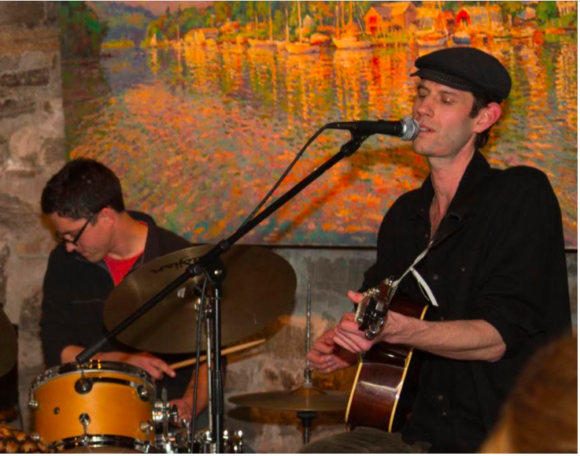 ESSEX — On Sunday, Sept.18, at 4 p.m., the Connecticut River Museum will host roots musicians Ben Hunter and Joe Seamons for an afternoon concert on the Museum’s riverside lawn. In three short years, Ben and Joe have established themselves nationally as critically acclaimed roots musicians and award-winning acoustic blues songsters. The duo are recent winners of the prestigious International Blues Challenge 2016 on Beale St. in Memphis TN. Rooted in their home of Seattle, Washington, they bring their unique integration of performance, folklore, and education with them to schools and communities nationwide. 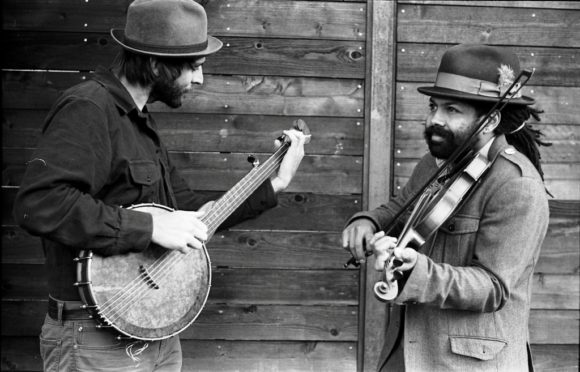 Ben and Joe formed their blues duo in 2012 after performing together for two years with Renegade Stringband. The music they play is truly American inspired by early 20th-century American folk and African music. Ben Hunter, born in the African nation of Lesotho, raised in Phoenix, Ariz., is a classically trained violinist who studied music around the world. Joe Seamons has shown a devotion to Northwest American folk music, receiving a Woody Guthrie Fellowship from the BMI Foundatio; he studied the banjo with Hobe Kytr. Opening the show are local favorites Ramblin’ Dan Stevens and Clayton Allen who met Hunter and Seamons as fellow competitors at the Blues Challenge in Memphis. In a melding of diverse blues styles, Dan and Clayton have forged a unique sound, representing a wide variety of traditionally based fingerpicking with a tinge of primitive blues and early blues rock and roll. A dose of Diddly Bow and Cigar Box guitar backed with a driving rhythm and gospel influenced vocals infuse their style with an engaging rock bottom authenticity. Stevens’ MusicNow Foundation, located in Old Lyme, was instrumental in bringing Hunter and Seamons to the area and is a co-beneficiary in the proceeds from the concert. The mission of MusicNow is to engage, enrich, and inspire young aspiring artists by providing performance opportunities, workshop programming and mentorships thereby nurturing creative and artistic growth and supporting the development of live music in our communities. For more info on MusicNow, visit www.musicnowfoundation.org. Concert-goers are invited to bring chairs or picnic blankets for festival-style seating on the Museum’s front lawn. Porky Pete’s Barbecue will be present serving grilled fare, and the Museum will offer a cash bar providing beer and wine. In the advent of inclement weather, the show will take place in the Museum’s boat house. Tickets for this event are $12, with a discount for Museum members. They can be bought at the gate or online at ctrivermuseum.org. I am supporting Norm Needleman for State Senate in the 33rd district because I have seen his character firsthand. Actually, I wouldn’t be where I am today without Norm. He hired me as a graphic designer for his company while I was attending college, and at a time when I could not afford my tuition, he was generous enough to pay it for me. After graduating, I continued to work for his company, and the professional growth Norm fostered enabled me to achieve my current role as a design manager for Macy’s. 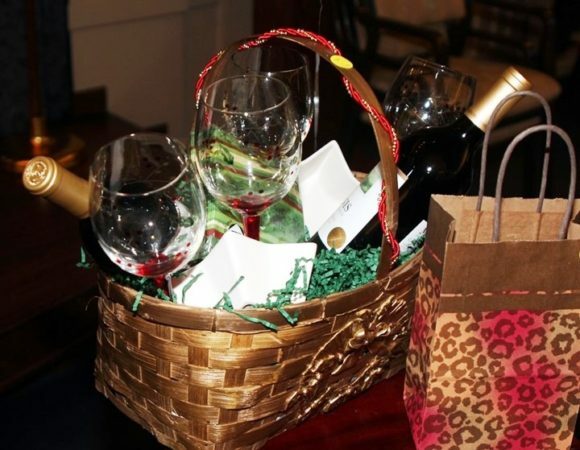 A wine basket like this one will be part of Saturday’s Grand Raffle. AREAWIDE — Literacy Volunteers Valley Shore’s Annual Wine and Brew Tasting and Auction Event is set for Thursday, Sept. 29, at 5:30 p.m. at the Saybrook Pavilion in Old Saybrook. Sponsors and exciting auction items have been added to the lineup. Sponsors for the event include Seaside Wine & Spirits of Old Saybrook with the Clark Group as this year’s presenting sponsor. Tickets are $30 per person for an evening of great wines, beers and wonderful food. Buy tickets or obtain more information by calling 860-399-0280 or go online to www.vsliteracy.org. 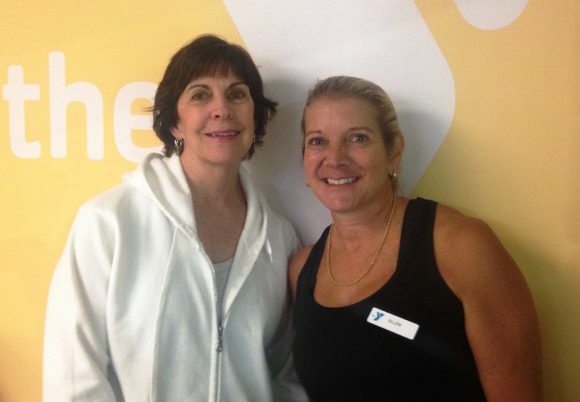 The Wellness Program for people with Parkinson’s Disease program at the Valley Shore YMCA is led by Mary Charlton (left) and Ellen Nichele (right). AREAWIDE — The Valley Shore YMCA is now offering a wellness program specifically designed for people with Parkinson’s disease led by OhioHealth Delay the Disease-certified instructors Ellen Nichele and Mary Charlton. Delay the Disease™ is an evidence-based fitness program designed to empower those living with Parkinson’s disease by optimizing their physical function, helping delay the progression of symptoms and improving their mental and emotional realities. Participants observe improvement in posture, balance, handwriting, mobility, speech volume and daily functional challenges. Classes will be offered from 1 to 2 p.m. Tuesdays and Thursdays beginning Oct. 25, at the Valley Shore YMCA. Individuals interested in Delay the Disease classes can contact Nichele at 860-399-9622 ext. 121 or enichele@vsymca.org. For additional information, visit vsymca.org. ESSEX — Essex Financial Services has announced that Financial Advisor and Vice President, James M. Sullivan, AIF®, has been named to the 2016 edition of the Financial Times 401 Top Retirement Plan Advisers. The list recognizes the top financial advisers who specialize in serving defined contribution (DC) retirement plans. Once again, the final FT 401 represents a cohort of elite advisers: the “average” adviser in this year’s FT 401 has 18 years of experience advising DC plans and manages $950 million in DC plan assets. The FT 401 advisers hail from 41 states and Washington, D.C., and DC plans on average account for 74 percent of their assets under management. The Financial Times 401 Top Retirement Plan Advisors is an independent listing produced by the Financial Times (September 2016). This award does not evaluate the quality of services provided to clients and is not indicative of this advisor’s future performance. Neither the advisors nor their parent firms pay a fee to Financial Times in exchange for inclusion in the FT 401. The Essex Democratic Town Committee is hosting a Meet the Candidates event on Saturday, Sept. 17. The event will take place from 1 to 3 p.m. at Viney Hill Brook Park in Essex, near the town’s swimming area. The event is open to everyone regardless of age or political affiliation. Free refreshments will be served. Come and meet community members and learn more about the candidates and the issues. Directions: Take Saybrook Rd. to Gates Rd., to Cedar Grove Terrace, turn right on Hillside Dr. and follow road to the park entrance. The fall session will be held on Wednesday evenings, Sept. 14, 21, 28 and October 5, 6-8 p.m. at TTYS, 56 High Street in Deep River. A winter session will be held also on Wednesday evenings, January 18, 25, and February 1 and 8, also at Tri-Town from 6-8 p.m. Classes fill quickly, so register soon – online (www.tritownys.org) or by calling 860-526-3600. Tri-Town Youth Services supports and advances the families, youth and communities of Chester, Deep River and Essex. It also coordinates and provides resources needed to make positive choices, reduce substance abuse, and strengthen the relationships that matter most. Discover programs and information for families, as well as opportunities for community collaboration at www.tritownys.org. ESSEX – HOPE Partnership’s Annual Night at the Theatre is fast approaching and the event is expected to be sold out. This year’s event at the historic Ivoryton Playhouse, takes place on Thursday, Sept. 15, and features one of the world’s most popular musicals, Man of La Mancha, starring Connecticut’s own David Pittsinger. One of the world’s most popular musicals, Man of La Mancha, the “Impossible Dream” musical, is based on Cervantes’ masterpiece Don Quixote, and tells of the adventures of a mad, aging nobleman who embarrasses his respectable family by his adventures. At times both inspiring and thought provoking, the story is both very entertaining and moving, and will warm the heart of everyone whose spirits were ever raised by the prospect of a victory by the underdog against all the odds. HOPE Partnership is a non-profit dedicated to educating, advocating and developing affordable workforce housing opportunities in Southern Middlesex County and the surrounding communities. The need for affordable housing for those who work in our community continues to be a challenge and HOPE looks for creative ways to meet this challenge. HOPE is grateful for the support and sponsorship of: Guilford Savings Bank & Liberty Bank, Shore Publishing, Bill & Mary Attridge, Tower Laboratories, The Clark Group, Connecticut Home Builders & Remodelers Association Charitable Foundation, Harding Development Group, First Niagara Foundation, Cloutier & Cassella LLC, Essex Savings Bank, David & Eunice Royston Family, Lorensen Enterprises, Thompson & Peck, St. Paul Lutheran Church, CT River Lumber, OSFD Charitable Fund, Common Sense EMS, Women’s Institute for Housing & Economic Development, Lenny & Joe’s, Londregan Real Estate, Saybrook Point Inn and Angelini Wines. This year’s event will feature a pre-show cocktail party beginning at 6 p.m., sponsored by Guilford Savings Bank, with an abundance of hearty hors d’oeuvres on the theatre’s tented blue stone terrace. The show begins at 7:30 p.m. and dessert will be served during intermission and following the show. For tickets ($80) or to donate to HOPE, visit www.hope-ct.org or call (860) 388-9513. 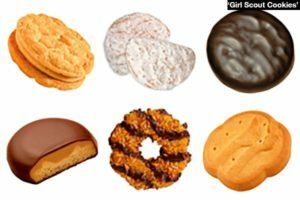 OLD SAYBROOK — Girl Scouts in Connecticut will be hosting statewide cookie booths at a variety of locations starting through Sunday, Nov. 13. Girl Scouts will be selling cookies at Stop & Shop, 105 Elm St., Old Saybrook on Nov. 13, from 8 a.m. to 12 p.m. Cookies include favorites such as Thin Mints, Samoas, Tagalongs, Do-si-dos, Trefoils, and Savannah Smiles. For more information on the Girl Scout Cookie Program, visit gsofct.org. Lyme First Selectman Ralph Eno (left) today endorsed Essex First Selectman Norm Needleman for State Senator. 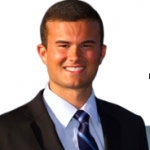 LYME – Today, Lyme Republican First Selectman Ralph Eno endorsed Democratic State Senate Candidate Norm Needleman. Eno, a Republican, has served as the first selectman of Lyme since 2007 and, with a brief interlude, for 10 years prior to that. 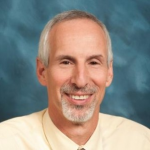 Norm Needleman is the founder and CEO of Tower Laboratories, a manufacturing business. As CEO, he has built the business over the past 37 years to become a leader in its segment, employing 150 people at facilities in Essex and Clinton. Needleman is in his third term as first selectman of Essex and was first elected as a Selectman in 2003. Needleman is challenging incumbent State Senator Art Linares, who is running for a third term and like Eno, is a Republican. 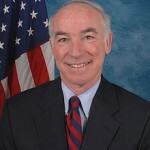 Linares was first elected in 2012 to the 33rd State Senate District seat, which was held for two decades by the late former State Senator Eileen Daily of Westbrook. He won a second term in 2014, defeating Democrat Emily Bjornberg of Lyme on a 22,762-17,326 vote. The 33rd State Senate District consists of the towns of Chester, Clinton, Colchester, Deep River, East Haddam, East Hampton, Essex, Haddam, Lyme, Portland, Westbrook, and part of Old Saybrook. Click here for audio of the event: http://norm.vote/eno.mp3. Click here for photos of the event: http://bit.ly/2bZWKDT. Sen. Art Linares (left) and Executive Director of the Connecticut Early Childhood Alliance Executive Director Merrill Gay. 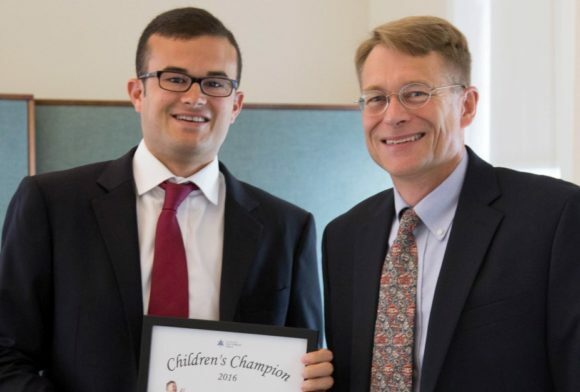 AREAWIDE — In a Sept. 8 ceremony at the start of a Middlesex Coalition for Children meeting at deKoven House in Middletown, Sen. Art Linares was presented with a 2016 “Children’s Champion” award by the Connecticut Early Childhood Alliance for his leadership on issues related to Connecticut’s young children. The other local legislators honored at the same ceremony were Sen. Len Fasano, Sen. Dante Bartolomeo, Rep. Matthew Lesser and Rep. Noreen Kokoruda. A total of 29 legislators were recognized in ceremonies statewide. Connecticut Early Childhood Alliance (www.earlychildhoodalliance.com) is a statewide organization committed to improving outcomes in the areas of learning, health, safety, and economic security for children ages birth to age eight. Every year, the Alliance recognizes legislators for their leadership on issues that impact the well-being of Connecticut’s young children in the areas of health development, early care and education, nutrition, and safety. An Assistant Minority Leader, Sen. Linares, 28, is the lead Republican senator on the state legislature’s Planning and Development Committee. He also serves on the Education Committee, the Internship Committee and the Judiciary Committee. Sen. Linares has previously served on the Children’s Committee, the Commerce Committee and the Banks Committee. Sen. Linares represents Chester, Clinton, Colchester, Deep River, East Haddam, East Hampton, Essex, Haddam, Lyme, Old Saybrook, Portland, and Westbrook. On the web: www.SenatorLinares.com. 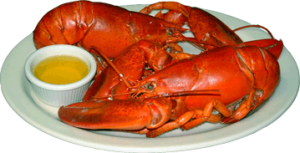 CHESTER — The Rotary Club of Chester holds its 46th Annual Lobster Festival at the Chester Fairgrounds tomorrow, Saturday, Sept. 10. Tickets are available at LARK, Chester Package Store, Chrisholm Marina and Chester Bottle Shop, at the Sunday Market, from any Chester Rotarian and on-line at http://chesterlobsterfestival.com and http://www.ChesterRotary.org. Join friends and family for a memorable evening of great food, good fun and live music. See a great variety of antique cars at Sunday’s event. 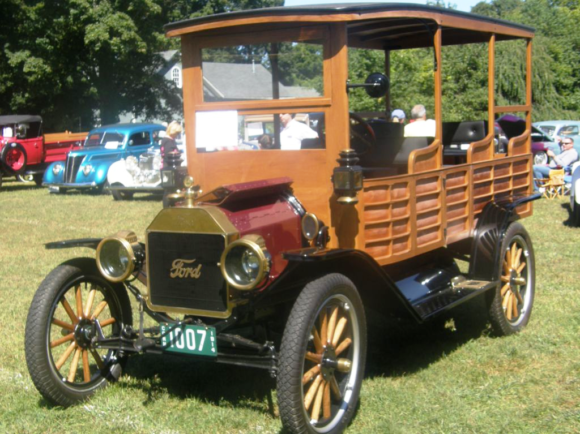 DEEP RIVER — The Deep River Fire Department will be holding its 3rd annual Antique Automobile Extravaganza and Flea Market, Sunday, Sept. 11, at Devitt’s Field in Deep River. The show will run from 9 a.m. until 2 p.m. The Automotive Extravaganza will feature cars, fire trucks, bikes and tractors. Categories start with pre-1920 and encompass increments of every ten years, per class, up to 2016. People’s choice awards in each category, as well as the Atwood Auto Award for “Best in Show”. This wonderful old automobile was on show at last year’s event. Proceeds benefit Deep River Fire Department related projects. Come out and support the Deep River Volunteer Fire Department’s fund raiser and enjoy the remarkable automotive history, kept alive by people who exhibit their beautiful automotive artifacts. AREAWIDE — Ann Lander has been named a winner of a Shore Publishing 2016 Beacon Award for her work with Literacy Volunteers Valley Shore (LVVS). Lander is being recognized for her dedication to LVVS as a Workshop Leader, Conversation Social facilitator, Tutor, Student Services Coordinator and volunteer at the organization’s fundraisers. Her selflessness and commitment to helping tutors and students improve lives in the shoreline communities for over 20 years makes her more than deserving of this recognition. The Beacon Awards recognize a few outstanding individuals who selflessly step up to help fulfill the Shoreline community’s promise as a place of opportunity, well-being, and safety for all. Lander will be officially recognized at the annual Beacon Awards Dinner to be held at Water’s Edge Resort & Spa in Westbrook on Sept. 28 at 6 p.m.
ESSEX, CT – Essex Winter Series will celebrate 40 years of quality artistic presentations with a special Fenton Brown Emerging Artists Concerts, Plus! benefit event on Saturday, Sept. 17, at a private home in Essex. Proceeds from the event will support the Emerging Artists fund and community outreach programming. Artistic Director Mihae Lee has planned a beautiful program at which she will perform on piano and will be joined by Series favorite, William Purvis (horn), as well as upcoming artists the Argus Quartet (strings), Aaron Plourde (trumpet), and Matthew Russo (trombone). Selections to be performed include Haydn’s String Quartet in C Major, op. 74 no. 1; Fauré’s Pavane for horn and piano, op. 50; and three renaissance pieces for brass trio. Through this fall fundraiser, grants, and individual contributions, Essex Winter Series is able to sustain its community outreach programming in which emerging artists perform for area schools and senior residences, and present a master class. Tickets for the Sept. 17 benefit and reception are $150 per person and may be purchased by calling the Essex Winter Series office at 860-272-4572. Bringing world-class classical and jazz music to the shoreline area was the dream of the founders of the Essex Winter Series. 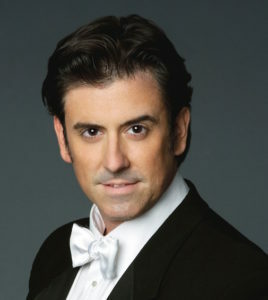 The late Fenton Brown became involved early on and devoted many years to expanding the series, and ultimately recruited pianist Mihae Lee to become Artistic Director. The “Fenton Brown Emerging Artists Concert” series was begun to honor Brown’s commitment to promoting the careers of young artists. Each year, the Essex Winter Series presents a series of concert performances by top-rated musicians from around the world – with each season including a mix of such performances as chamber music, instrumental soloists, opera singers, symphony and chamber orchestras, and jazz bands. For additional information about the Sept. 17 benefit or the 2017 concert season, call 860-272-4572 or visit www.essexwinterseries.com. ESSEX — Gregory R. Shook, President and CEO of Essex Savings Bank announced the completion of the distribution from the Board of Directors’ portion of the Community Investment Fund. Total distributions for the year will amount to $110,000. The program, which has run annually since its inception in 1996, distributes up to 10 percent of after tax net income to local non-profit organizations. Angel Charities, Inc. * Camp Hazen YMCA * The Chester Historical Society, Inc. * Child & Family Agency of Southeastern Connecticut, Inc. * Community Foundation of Middlesex County * Connecticut River Museum at Steamboat Dock * Friends of the Old Lyme-Phoebe Griffin Noyes Library Association, Inc. * Ivoryton Village Alliance * Katharine Hepburn Cultural Arts Center & Theatre * Lawrence & Memorial Hospital * Lyme Academy College of Fine Arts * Lyme Land Conservation Trust * Lymes’ Youth Service Bureau * MacCurdy Salisbury Educational Foundation, Inc. * Madison Land Conservation Trust * Rotary Club of Essex Foundation * Tri-Town Youth Service Bureau, Inc. * Valley Shore YMCA * Vista Life Innovations. Essex Savings Bank is a FDIC insured, state chartered, mutual savings bank established in 1851. The Bank serves the Connecticut River Valley and shoreline with six offices in Essex (2), Chester, Madison, Old Lyme and Old Saybrook providing a full complement of personal and business banking. Financial, estate, insurance and retirement planning are offered throughout the state by the Bank’s Trust Department. Anna Twinney with her own rescue, Aria, at her home in Elizabeth, Colo.
EAST HADDAM — Everyone talks to their dog. Those of us with pets, have had casual “conversations” with our furry, feathered, or even finned friends. It’s human nature to chat. We’ve likely bent Rover’s ear too long over trivial irritations that happened at work or lamenting the tedious commute home. Our pets have long been victims of our mindless self-talk and keepers of our deepest secrets. On Sept. 9-11, Twinney will lead a group of animal lovers at Ray of Light Farm in East Haddam on a journey to tap into their inherent abilities. Animal Communication is not supernatural, but a natural way of communicating with animals and even people. Animals communicate telepathically with one another all the time — we just need to reawaken those intuitive senses to explore this extraordinary skill. Twinney is sought out all over the world by concerned pet and horse owners hoping to find answers to behavioral issues, health problems and other mysteries. Her own journey into animal communication began over two decades ago. Having unlocked this missing piece of the puzzle, Twinney knew that she had to share her knowledge. 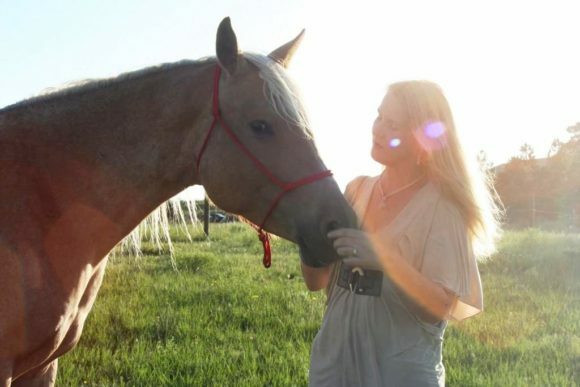 Now known the world over for her exceptional abilities, specific, verifiable methods and extensive knowledge of horses, Twinney often found animal communication techniques helpful during her work with horses as well. “The language of the horses, called Equus, is almost completely non-verbal. While horses have the ability to vocalize and they do use it … the nuances of their language is in the subtitles only seen by those fluent in the language,” Twinney explains. The “Evening of Animal Communication” workshop is truly a step through the wardrobe into a world that most people only dream of. To learn more about Animal Communication, Twinney and the event at Ray of Light Farms, visit ReachOuttoHorses.com or to learn more about Ray of Light Farms and the rescue efforts there, visit www.RayofLightFarms.org. A portion of the proceeds from Twinney’s workshops will be earmarked to support the ongoing horse rescue and rehabilitation at Ray of Light. As the presidential election intensifies, campaigns have focused on inner-city issues of poverty, drugs and crime. Most of these arguments are based on statistics rather than the kind of real-life insight offered by people who have survived the worst city neighborhoods. 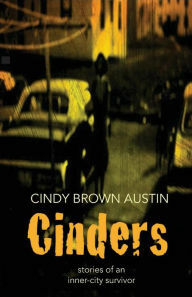 Cindy Brown Austin, author of the new acclaimed memoir, “Cinders,” brings that inside view to Chester in a free program on Sunday, Nov. 6, at 9:30 a.m., as part of Congregation Beth Shalom Rodfe Zedek (CBSRZ)’s long-running Books & Bagels series. In time, after she and her longtime husband David Austin had their fourth daughter, she began to describe her experiences in print, publishing many accounts from urban life in the Hartford Courant’s Northeast magazine, and then reprinted in Reader’s Digest, where she attracted a national following. Congregation Beth Shalom Rodfe Zedek is located at 55 East Kings Highway in Chester. For more information, visit our website or call the office at 860-526-8920. After a prolonged and courageous struggle with cancer, Marianne Sullivan passed away peacefully on Saturday, September 3rd at home, surrounded by family and loved ones. Marianne was born in New Haven, Connecticut on December 14th, 1946, daughter of the late William and Virginia Montgomery. Marianne was a long time resident of Guilford, Connecticut where she spent the majority of her career as a reporter and editor for several local newspapers including the New Haven Register, and the Shore Publishing Group’s local news publications. 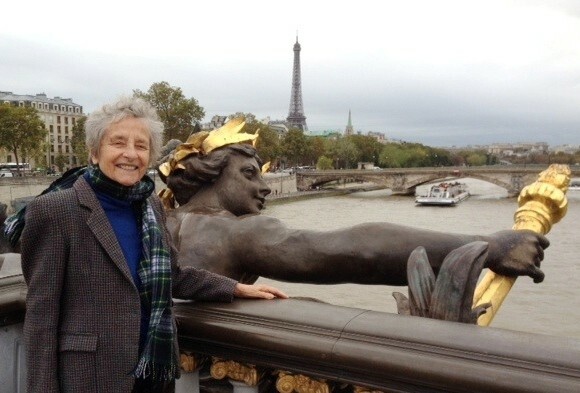 She was an avid reader and possessed masterful writing skills honed over her 40-year career. She enjoyed covering politics and once served as a Selectman for the town of Guilford. She is survived by her sister Donna Lee and her four sons Brian, Barry, Sean and Kenneth Sullivan, two nieces Michelle Richards and Melissa Hernandez, and three grandchildren Courtney, Conner and Riley Sullivan. She was a devoted mother and friend, a stoic person with the enviable ability to take on life’s many challenges courageously and without complaint. To those who knew her well, she was selfless and incredibly inspirational. She saw life clearly and brought a quick and ready wit to bear on daily happenings. To say she will be sorely missed would be an understatement. 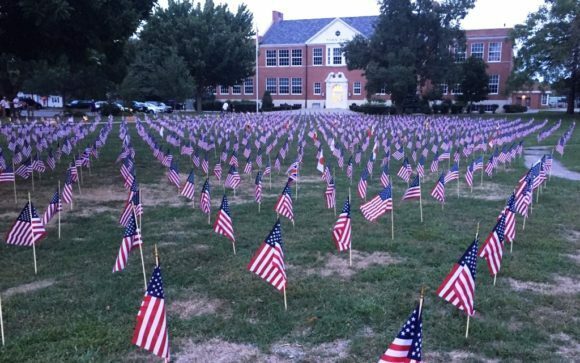 A memorial service will held at St. George’s Church on 33 Whitfield St, Guilford, Connecticut on Friday, September 9th at 10 a.m. In lieu of flowers, the family requests that donations in Marianne’s memory be made to The American Cancer Society.